In the 1890's European Starlings were brought to America and released. These aggressive birds are often considered a nuisance to native birds. European Starlings have glossy black colors and specks of white that make them striking to see in the sunlight. Adaptable and comfortable living near people, it's common to find European Starlings in backyards and bird houses across the U.S. today. European Starlings have large families (5-7 eggs per brood) and often have more than one brood a year. Grasshoppers and other insects are a European Starling's first choice for food, but a hungry flock will empty a bird feeder of seed when food is scarce. What started as a misguided attempt to introduce Shakespearean birds to North America in the late 1800’s has led to the widespread expansion of European Starlings across the United States. These black songbirds, commonly referred to just as "starlings", are easy to spot as they stay in large flocks for most of the year. 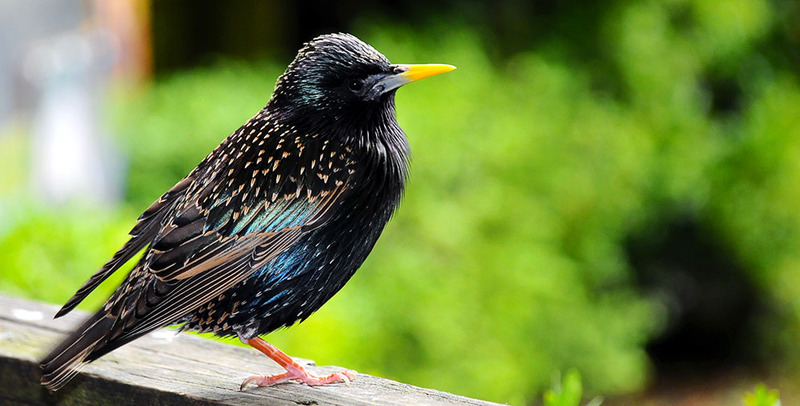 European Starlings are medium-sized stocky black birds that often appear to have a glossy sheen on their feathers. Sometimes described as purple, the color and markings of European Starlings are make them easy to identify. White polka dots or specks of white are commonly found on the birds in Fall, and are actually the white tips of the new feathers. Within a few months the white has worn off, leaving the birds a solid black color in late Winter or early Spring. You may hear European Starlings coming before you see them. These vocal birds make a variety of sounds. 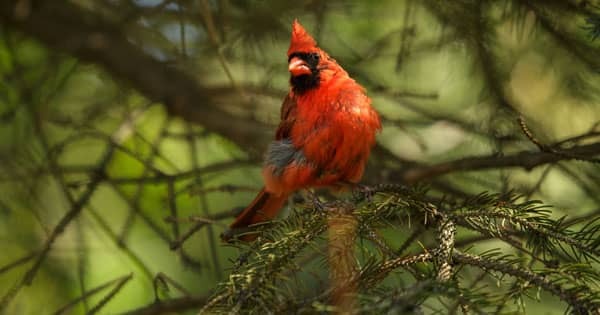 From short bursts that mimic hawks to their own unique songs, you don't find these songbirds being quiet for long. One of the traits European Starlings share with Blue Jays is their ability to imitate other birds. European Starlings are not afraid to live near people, and can often be seen eating insects off of a freshly mowed lawn or sitting on a telephone line. While they feed on the ground, they prefer to make their homes in lightly wooded areas. The combination of grass or open fields, along with trees or structures on which to nest, makes many suburban areas the perfect choice for European Starlings. Their food of choice is insects, but they will eat other food if it’s readily available. Grasshoppers are a favorite meal, but European Starlings are not picky eaters. European Starlings will eat wild berries or even some berries that grown on bushes in the front or back yard. Often if European Starlings can't find insects in a field, they will eat grains or seeds. If you've attracted a flock of European Starlings to your bird feeder - beware. 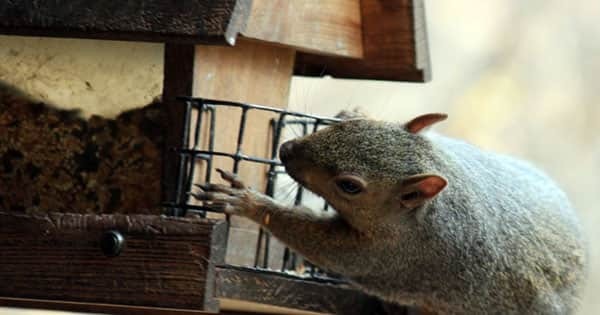 They can quickly devour your suet or bird seed, and will chase off other birds that try to feed. Consider removing the feeder for a day or two to discourage the European Starlings, and once they have moved to another food source you can put your bird feeders back up. Nests of European Starlings are messy and made up of twigs, grasses and needles from pine trees. 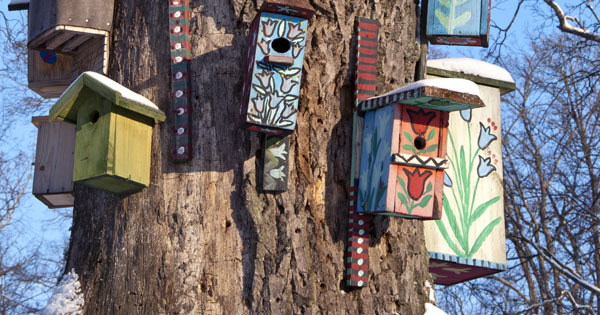 These birds will nest in a tree or building cavity, or in almost any small bird house. 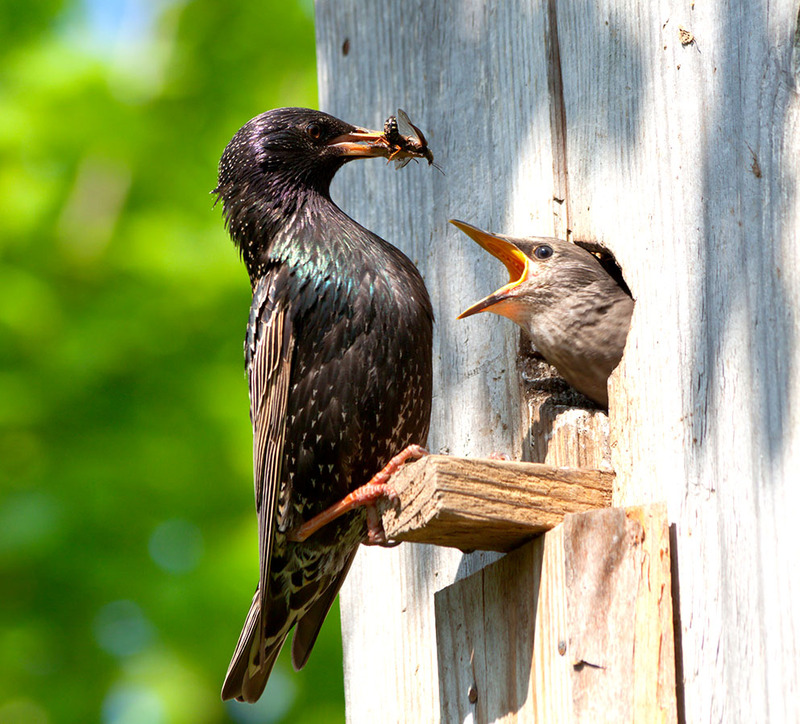 The aggressive nature of European Starlings makes them a danger to more timid birds who share similar nesting preferences. Purple martin community monitors are especially attentive to European Starling invasions. European Starlings will aggressively defend their territory, sometimes chasing dogs and other animals off (in addition to other birds). The males begin building their cup-shaped nests before they find a mate, hoping the nest will attract an interested female. Once the birds pair off, the female usually lays 5-7 eggs which will be incubated by both birds for about two weeks. Once the eggs hatch, the nestlings will stay in the nest for another three weeks under the care and observation of their parents. It’s common for European Starlings to have more than one brood each season, which has contributed to their aggressive expansion across the United States.